June: cupcakes, collections and snow globes. Oh, my! As the title illustrates, the pinboard also featured all thing ‘collections’. We’ve seen delightful collections of Pez dispensers, ice cream flavors, painted sticks, books, and even a wall of fertilizer bags. June also found me visiting the studio of Denver-based artist Phil Bender for work. Phil is known for his eclectic use of found materials, usually the nostalgic detritus of our consumer culture, in rigid geometric compositions reminiscent of Minimalist works from the 1970s. You can view some of his works here. I found my visit to Phil’s studio was a study in what collecting can be in its most extreme state (see example below). June also marked the beginning of the DAMC Salon Series. Each event in this series is a visit to a private home and collection of a Denver-area patron of the Museum. Attendees, who pay a not-so-trivial sum to attend, hear from collectors about how they got started collecting and what keeps them excited about collecting, and living with, contemporary art. These events are always a success for us; as it turns out, we all like to have an excuse to see how other people live. I’ve facilitated three years of Salons, and one thing I’ve noticed is that over the years the same sentiment keeps popping up with many of the collectors I’ve worked with: collecting is like a disease. Oh, and that one should always collect what they love. All of the focus on collections this month made me reconsider my own habits of collecting. I’ve always accumulated things, which I attribute to my over-sentimentalizing of objects. There is one particular standout: for whatever the reason (and I genuinely don’t recall how it started) I have a collection of snow globes. They’ve been mostly boxed up and stored away for the past four years, but when I was invited to collaborate on the “collections & cupcakes” pinboard I knew I would have to unpack them. And unpack them I have. And in unpacking them and lining them up to photograph them I realized something: I love them. As absurd as they are, I truly love how they flood me with fond memories whenever I pass them. Why did I ever box them up and try to tell myself I was ‘over’ collecting them? 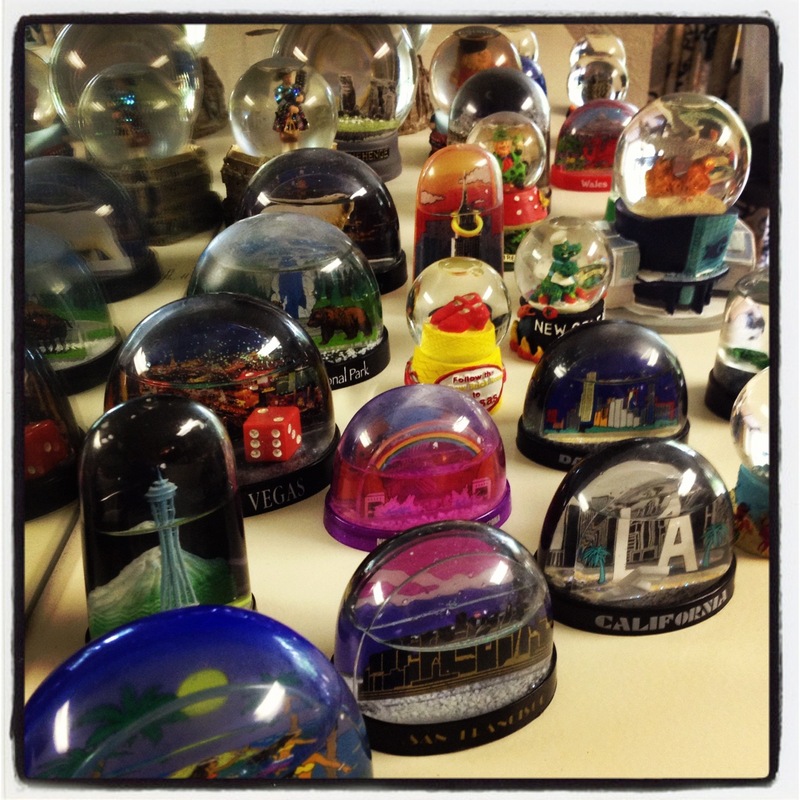 As I saw all of the snow globes lined up, memorializing so many places I’ve been (and some I haven’t), I became ashamed I ever ‘stopped’ collecting them because I was worried what house guests would think of my collection. Missing now are Budapest, Prague, Kyoto, Tokyo… such significant moments in my life are absent from my collection! Now I find myself dusting off my collection, displaying them proudly, and scouring eBay for snow globes to fill the gaping holes in my collection.